The Alliance Care Management department offers services to manage the health care needs of our members. Please download and share this brochure with your staff and your Alliance patients. Click to download this brochure in English, Spanish, or Hmong. The Alliance Care Management department offers support to members and their caregivers to improve or maintain health and quality of life. We offer case management, care coordination, health education programs, and cultural and linguistic services. Care Managementâ€™s multidisciplinary team includes experienced nurses, medical social workers, care coordinators, health educators, and Alliance Medical Directors. The Care Management team works alongside primary care providers (PCPs) to support our membersâ€™ health care needs through the Patient-Centered Medical Home (PCMH) model. 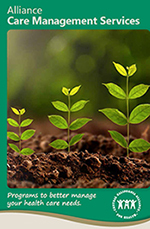 Care management services are voluntary, and available to all eligible Alliance members. Members who do not wish to participate in our services can opt out at any time. topics, including how to navigate the health care system. 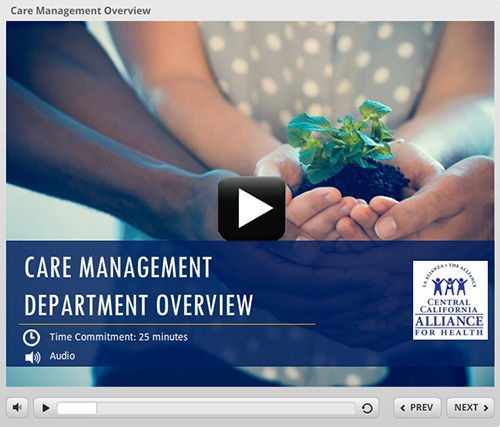 For more information, check out the Care Management Services Quick Reference Guide and view the video below. Explore our Care Management services by clicking the links below.